You do still have time to book your place for the Newcastle reunion! Don't be disappointed, get your booking form off to Sue Spence as soon as possible. Final details of the programme are in a downloadable PDF here. A near-final guest list is available here. John and Sue are looking forward to meeting you all in Newcastle in October. As previously advised, some re-arrangement of activities has had to be made to the original plan but organisers Sue and John Spence have tried to make changes that cause the least possible inconvenience. See Sue's letter here. The revised programme is shown below. The main change is that the reunion dinner will now be on the Friday evening (rather than Saturday). This means the informal Friday evening get-together on the Quayside will not now take place. 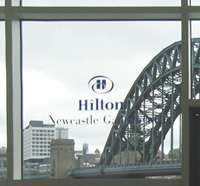 The 11th UK BI Reunion will be held at the Newcastle/Gateshead Hilton Hotel. 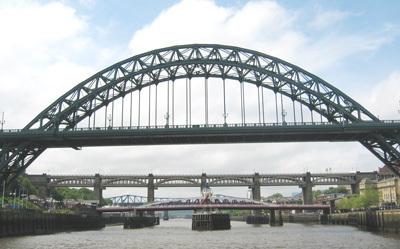 This 4-star hotel has an imposing riverside location on the south bank of the Tyne between Stephenson's High Level Bridge and the Swing Bridge and enjoys a panoramic view of the river and the city of Newcastle. The reunion dinner will be held in the Gateshead Suite and lunch in the restaurant (for our sole use) overlooking the river. The Hilton has 254 well-appointed bedrooms, some with river views. Leisure facilities include a pool and health and fitness centre. There is ample car parking at the hotel. 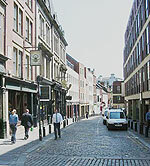 A regeneration programme has revitalised both north and south banks of the Tyne. From the hotel a ten-minute stroll takes you to the 'blinking eye' Millennium Bridge, past the spectacular modern Sage centre for music and the arts, to the Baltic, formerly a grain warehouse, now transformed into the Centre for Contemporary Arts. Over the river there are many bars and restaurants on the Quayside which, along with the city and region, is endowed with some stunning public art, the most famous example being The Angel of the North on the approach from the south. Flights to Newcastle arrive from Birmingham, Exeter, Gatwick, Jersey, Manchester, Plymouth and Southampton. 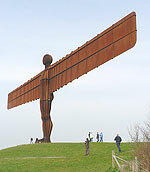 Newcastle has good road connections: AI north and south, the A68 from Edinburgh, the A69 from Carlisle, connecting the M6 (south) and the A74 (Glasgow). 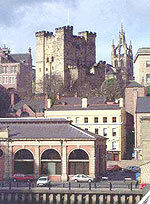 The city also has excellent rail services with direct trains from London, York, Edinburgh, Glasgow, Manchester, Birmingham, Bristol and Exeter. We are fortunate to have teamed up with Travel Services of Colchester, co-owned by BI Cruising Department manager John Rees (who was directly involved in establishing educational cruising, its initial success, and then in marketing the ships to foreign schools and groups). Travel Services has been negotiating with the hotel on our behalf and will be handling all accommodation arrangements for us. Bookings should be made on their booking form. If you are intending to join us please complete the BI Reunion Booking Form and return it to me with your cheque for £36.00 per person (covers deposit and £6 registration fee) as soon as possible*. This will be held in the Gateshead Suite from 19.00 for 20.00. There will be a three-course menu, with dietary alternatives on request. There will be the usual pre-dinner wine order service in the bar/reception area from 18.30. Dress: Jacket & tie/smart casual. Please add your names to the table seating plan and indicate the names of friends you wish to sit with, even though at this stage you may not know if they will all be attending. Similarly, if you plan to make up a table of 10 please list their names. Hopefully Sue can accommodate some, if not all, of your requests and try to ensure that each of you knows at least one other person seated at your table. Quay to Sea three-hour riverboat cruise, departing 16.00 at the earliest (to be confirmed) from the Millennium Bridge (Pitcher & Piano) with BI-accented commentary by a City Guide. A buffet dinner is included and will be served on the return half of the journey. 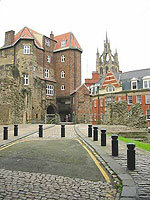 This journey back in time takes us downriver through the Millennium Bridge, symbol of the modern city, to the 11th Century Benedictine Priory at Tynemouth. We see the areas where in earlier times shipbuilding flourished and where BI ships Amra, Aska, Chakdina, Chindwara, Chilka, Dwarka, Ellenga, Manora, Merkara, Mulbera, Morvada, Palikonda, Sirdhana, Talamba, Talma, Zaida and Zira, to name a few, were built. Cost approx £21 per head. This will be held in the Windows on the Tyne restaurant. A selection of four main dishes of meat, fish and vegetables of varying strengths which will be served along with the usual accompaniments, or dietary alternatives, at £20.00 per head, based on a minimum of 60 persons. * Please make cheques payable to BI Reunion. The balance will be due at the end of July 2010 and I will send out a reminder in June along with confirmation of arrangements and a guest list. We'd like to assure you that we always try to keep costs down. We have managed to maintain the overall cost for 2010 at the 2008 reunion level, including a non-refundable registration fee of £6.00 per person for postage, name badges, stationery, telephones etc. Please note the price we will be invoiced by the hotel for dinner is based on a minimum of 200 guests. We are initially charging based on a minimum of 150, but hopefully our bookings will exceed this number, in which case we anticipate being able to reduce the cost per head accordingly.